Renko traders are a rare breed. ….as are nobel prize winners. Instead of candles or standard bars on your chart, you use Renko Bars instead. You set the number of pips you want these bars to represent. Let’s say you set this number at 10. Ignore the bar next to it. It has not reached either point yet. The next bar will complete as a long bar as well if it reaches +10 pips. Or it will complete as a short bar (the white ones) if it reaches -20 pips. It’s that easy. This is all Renko does. But if this is all it does, then why do some people obsess over it so much? Because as simple as it is, there’s quite a bit more to it. There’s a lot of noise on most Forex charts, making them hard to read for most people, and even harder to try and predict price movement for most actual traders. So much so, that most traders have resorted to drawing shapes and lines just to try and make sense of it all. And these methods are generally terrible, so these traders normally lose money. It’s rough, and not pleasurable for most people. So why not just get rid of all that? Could we? Filter out all the noise into simple blocks. And my oh my how those blocks go on big runs sometimes! The ability to filter out noise AND have a sort of built-in money management system that’s also easy to follow? Without having to worry about trailing stops and exit indicators, and all that stuff? Some people choose to put on the Renko headphones and get to see the market differently than most of us. He looks like his name could actually be “Renko”, no? Is Renko The Actual Answer? I can say that I’ve tried it, and came up with some cool stuff, but in the end, I found stuff that worked better on regular charts than I did on Renko. When you put Renko on your charts, you now play in a different dimension, and you tend to stay awhile. And stay awhile I did. Tested a lot out. I chose standard charts in the end. Renko looks great the first time you see it, then reality starts to set in. Kind of like a girl you meet on Instagram. The big thing to remember, and we don’t want to, is that when a Renko bar flips from one color to another, that’s a big swing. So play along with me — how would you trade Renko? Would you still be a trend trader? Would you trade as soon as the bar changes color in your direction? Because if you do, times like this are going to m-m-m-murder you. 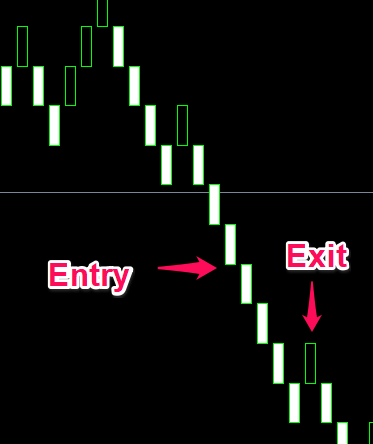 If you set your bars at 10 pips (your typical non-scalper wouldn’t do this, but just for this exercise we’ll stay with 10), these would be -20s every time. If you want to wait until a few bars are going in one direction before you enter, then exit when the color chages? That’s fine. But your wins aren’t going to be as exciting as you thought. Sweet downtrend bro…..that you only made 20 pips from. Some of the “oohs” and “ahhs” that came from when you first looked at Renko Charts go away once you actually start trading them. But this isn’t a reason to not even try. And it’s for one major reason. RENKO – The Final Frontier!! 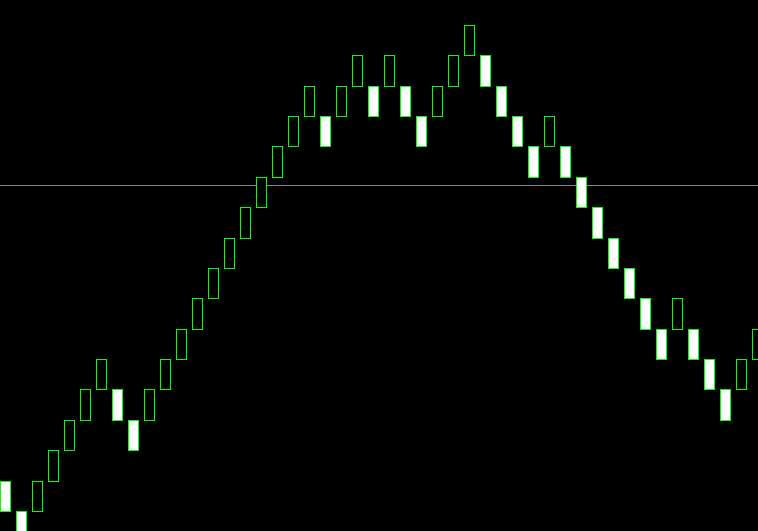 Get this — just about every indicator you’ve ever seen or used on a standard chart…..
….looks different on a Renko chart. The data Renko Bars give indicators is different than what standard charts tell indicators. Highs are different. Lows are different. Opens and closes are different. Moving averages will not look the same. Oscillators will not look the same. Fibonacci will still look ridiculous. But what this does is provide an opportunity, especially for people trading the No Nonsense Forex way. Almost everything we do here will still apply to trading Renko Charts. But these indicators, and what they do now, and how they play with each other…. If you have time to kill, and want to find the next goldmine, in a space where nobody is playing (because nobody out there as I write this is combining the two to my knowledge), this can be a very big opportunity. I know what to expect when I see an indicator for the first time. I have a pretty good guess of how well it’s going to perform just by eyeballing it, I’ve done this for so long. 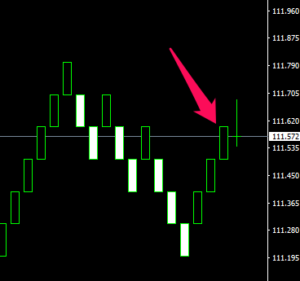 With indicators in Renko? Who the hell knows? I tested a lot, but forgot what they all did. And I didn’t spend years on it like I did with regular charts. But just know this — a lot of traders here are going to be way ahead of you if this whole experiment doesn’t work. This is fine because you’re not really in competition with them, but the time you may waste here, if it’s all for naught, will be time you don’t get back. Renko is a neat concept, with a Non Nonsense Forex type of wrinkle to it that makes it a really unique opportunity. Just know what you’re getting into. And if you’re young, and have time to kill these days, get into it! Just let your boy here know if you did end up finding the holy grail.